While the broadcast debut of Dale Earnhardt Jr. in the NASCAR on NBC booth is creating plenty of buzz around NBC’s first races of the season this weekend at Chicagoland Speedway, the uber-popular retired driver isn’t the only new addition to the network’s NASCAR coverage this year. Echoing its rink-side “Inside the Glass” position on NHL coverage, NBC will debut the Peacock Pit Box – a remote studio set built within a traditional pit box frame that will be located along pit road for pre- and post-race coverage at each speedway throughout the season. The 14-ft.-long x 12.5 ft.-wide Peacock Pit Box (a normal-sized NASCAR pit box is 10×8 ft.) features two-levels and is located in a traditional pit box right along pit road. In addition to serving as the home to NASCAR on NBC’s pre-race coverage throughout the season, the structure also features an arsenal of robotic cameras that will aid in NBC’s coverage of pit road throughout each race. The NASCAR on NBC team worked with the NBC Sports Group design team in Stamford, CT, to design the Peacock Pit Box, while Nitro Manufacturing built the structure and Game Creek Video provided technical support and equipment. 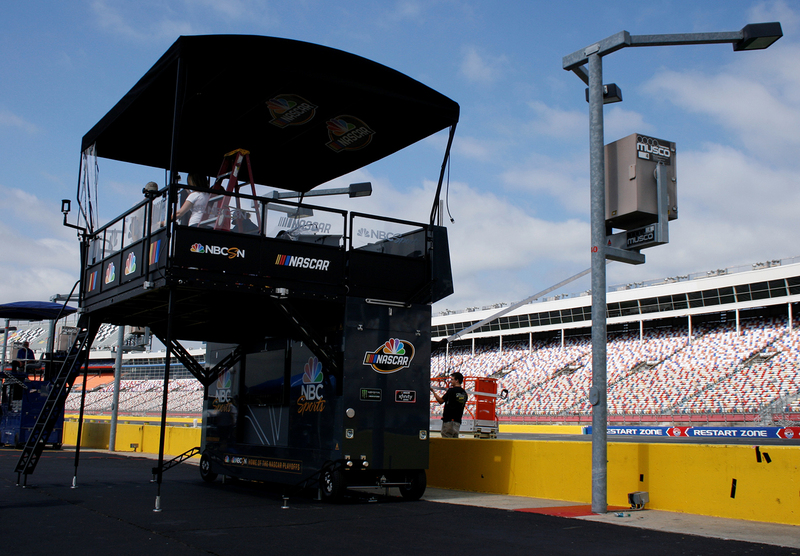 The top level of the Peacock Pit Box will serve as the primary home from NBC Sports’ Monster Energy NASCAR Cup Series and Xfinity Series pre- and post-race coverage, with host Krista Voda and analysts Kyle Petty and Dale Jarrett occupying the desk. One handheld and three robotic cameras will be on hand for pre/post-race shows. The 14-ft.-long x 12.5 ft.-wide Peacock Pit Box (a normal-sized NASCAR pit box is 10×8 ft.) features two-levels and is located in a traditional pit box right along pit road. Meanwhile, the lower level of the Pit Box will provide additional broadcast positions with two wired cameras and an occasionally an RF camera and/or a small jib (depending on the size of pit box at each track). The space features interactive displays and a show-and-tell position for analysts like Daytona 500-winning crew chief Steve Letarte to deliver deeper analysis of the track action. 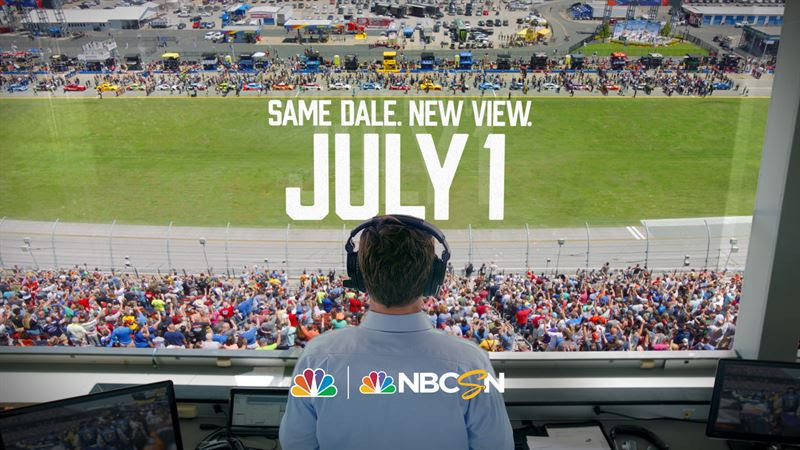 The lower level also features a patio position where NBC will look to conduct interviews with drivers, pit crew chiefs, owners, and NASCAR officials throughout its race coverage. 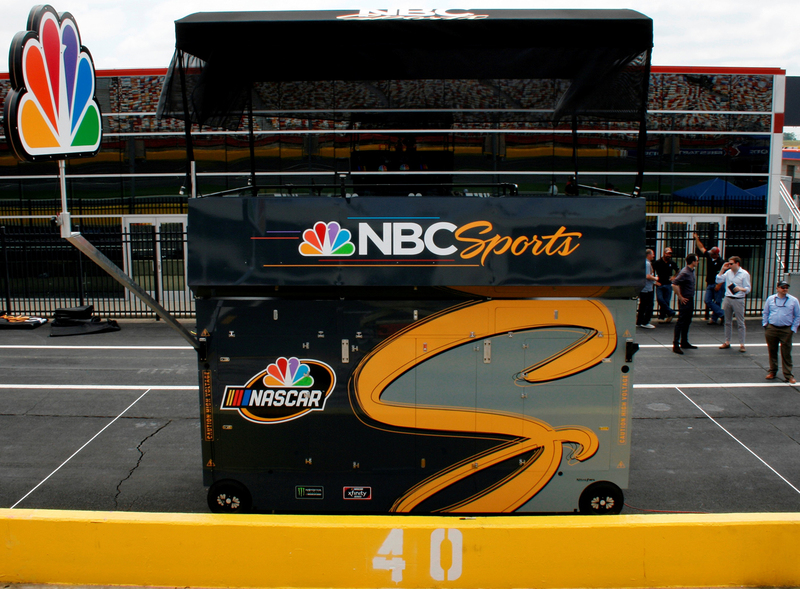 Since NBC’s pre- and post-race setup will vary week-to-week depending on the track, Thomas and company were tasked with making the Peacock Pit Box as versatile as possible. With that in mind, the upper level features nine different robotic camera positions. Three robos can be deployed at a time and – thanks to the small, lightweight cameras and custom-developed camera mounts deployed on the Pit Box – the operations team can quickly swap camera positions at any time during NBC’s coverage. Beloved NASCAR driver Dale Earnhardt Jr., who retired after last season makes his broadcast debut as NASCAR on NBC Analyst this weekend at Chicagoland. In addition to being used for pre- and post-race studio coverage, these robos will be utilized for coverage of the action on pit road throughout NASCAR on NBC telecasts. 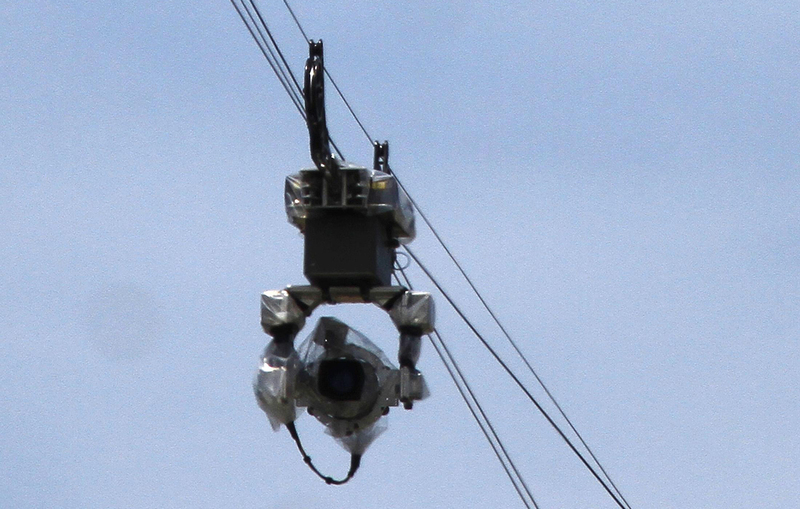 NBC Sports will deploy an average of 55 cameras – including the return of the BatCam point-to-point aerial system to cover the backstretch – on big races at Daytona, Indianapolis, and Homestead-Miami this season. Thomas also expects to use BatCam, which debuted last year and can hit speeds of over 100+ mph, at the Watkins Glen road course this year. The BatCam also drew rave reviews throughout NBC’s Triple Crown coverage this past spring. The bulk of NBC’s camera complement for NASCAR is made up of Sony HDC-4300’s along with a mix of robos (provided by Robovision) and roving RF cameras. BSI will once again be providing eight RF in-car-camera dual-path systems, which allow two angles to be transmitted from each car at any given moment. Thomas also says his NASCAR on NBC team is currently experimenting with several new camera positions, which he expects to roll out throughout the season. NBC is utilizing SMT’s tools for the fourth straight NASCAR season. This year, the SMT race crawl has been updated to show the live running order and driver statistics at the traditional position on top of the screen and in a new vertical pylon display on the left side. The multiple options provide production with a variety of ways to allow fans to track each driver. Also new this year is the SMT GOTO interactive touchscreen display, which provides several tools NBC can use throughout each race weekend, giving on-air analysts the ability to telestrate highlights, compare drivers and statistics, and interact with fans on social media. SMT’s new Broadcast Analytics system has also been added to help enhance the coverage. The system live tracks all the cars during each session and allows production to show a virtual replay of any lap run during practice, qualifying and the race. The system allows production to visualize any lap run by any driver. It can provide a combined display of how a single driver ran on different laps, showing changes they’ve made during the session. The system can also show how different drivers ran the same lap. All of these options will allow fans to see the key moments during each session and better understand how that impacted where each driver finished. Game Creek Video’s PeacockOne (A and B units) will once again serve as the home to the NASCAR on NBC production team on-site, while an additional pair of Game Creek trucks will house mix effects and editing, as well as robo operations and tape release. In all, NASCAR truck compounds will be stocked with an average of 19 trailers (including BSI, Sportvision, NASCAR operations, and more). “NASCAR does a great job setting up the compounds for us and providing a beautiful sandbox for us to play in,” says Thomas. In addition, the NBC production team continues to increase rely more and more on file-sharing with the NBC Broadcast Center in Stamford, CT. AT&T and PSSI have partnered established fiber connectivity at the majority of the NASCAR tracks and will provide NBC with a circuit back to Stamford for file-transfer, as well as home-running individual cameras for at-home productions. Pre- and post-race shows from the Peacock Pit Box will regularly send back cameras to a control room in Stamford, where the show will be produced.